Nepal’s 7.8-magnitude earthquake has claimed more than 8,500 lives, and is now officially the deadliest event in the country’s history. 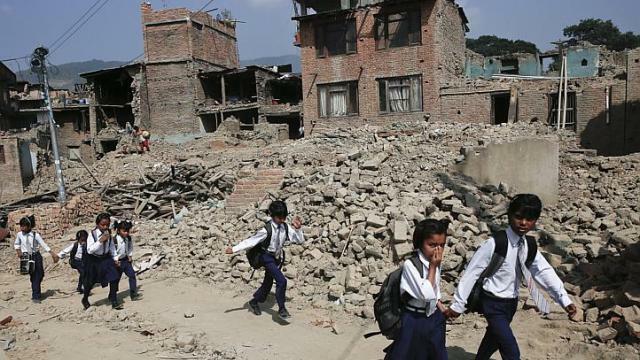 Since the April 25th tragedy, commentators and experts have opined about Nepal’s lack of preparedness, with indictments of shoddy infrastructure, poorly enforced or non-existent building codes, and inadequate response systems. International attention, aside from an uptick after a 7.3-magnitude earthquake on May 12th, has waned. Regrettably, factors underlying Nepal’s lagging structural resilience have received little coverage. Beyond disaster preparedness, true resilience is a net product of economic, social, and political conditions, factors which in Nepal’s case continue to threaten the country’s stability. Nepal now faces the realities of a slow, challenging, and likely unsung recovery. Addressing the difficulty of moving forward amidst this seeming hopelessness, a recent Guardian article argued “the mental and emotional impact of an earthquake is the other invisible disaster.” If any good comes of this disaster, aside from inspirational rescue and survival stories, it is that lessons from the impacts will be woven into a larger narrative concerning the continuing plight of Nepalese people. Even before the earthquakes, Nepal was not the commonly held impression of a simple-but-satisfied country with cheerful hillside villages. In a continuing disaster of nearly equivalent proportions, the country’s sagging economy has driven young Nepalese men to migrate in droves. The impacts are felt in the villages they leave, and in their own toilsome and dangerous lifestyles working as construction workers in wealthier Middle Eastern and Southeast Asian countries. Between 2006 and 2014, more than 1,000 Nepalese labourers died in Malaysia alone; more than one hundred die in Qatar each year. Construction on that country’s 2022 FIFA World Cup facilities could ultimately claim the lives of 4,000 migrant workers, a majority of whom are from India and Nepal. “Many Nepali migrant workers work in low-paying jobs with hazardous conditions – often known as the 3D jobs: dirty, difficult and dangerous,” says Richa Shivakoti, a Singapore-based migration analyst focusing on Nepal. This story has not emerged in popular media coverage, even during the latest disaster, but the migrant phenomenon is nonetheless highly relevant for exacerbating the country’s recovery challenges. Disaster resilience is about more than episodic foreign donations, which now resemble a global arms race of pity despite concerns about governments co-opting funds. Rebuilding takes manpower, but many of Nepal’s most able workers are absent. By some estimates, at least 7% of the country’s nearly 30 million people have already left and more than 500,000 do so every year. These are only the official statistics. Actual numbers may be higher. Remittances account for more than 25% of GDP, which is an indication both of the productive value of Nepal’s lost workers and of the country’s otherwise anaemic economy. With prospects so dim that upwards of 10% of citizens wilfully leave their families to risk life and limb working overseas, Nepal lacks fundamental resilience against any type of threat, natural or otherwise. Despite the current wave of Kathmandu residents returning to their home villages, the earthquake may intensify the exodus of workers in the long run, as Nepal’s economy—already suffering—struggles to recuperate. Because of the havoc created by the two major earthquakes, migration may even increase over the short- to medium-terms because of lack of employment opportunities. Nepal’s earthquake vulnerability is arguably a confluence of economic, social, and political conditions that deplete the country of human capital. Inadequate infrastructure, building codes, and response efforts are merely symptoms, and focusing on these issues misses the larger point. Countries with otherwise healthier economies and socio-political environments are typically more resilient. This disaster should therefore be a call to address Nepal’s broader failings, a lingering challenge after a decade-long Maoist insurgency and current political stalemate. Japan responded quickly and effectively after the 2011 Fukushima earthquake. Within several weeks, victims were housed, infrastructure was under repair, and living conditions were gradually stabilizing (e.g. simple provision of food and necessities). These circumstances were clearly different than those in Nepal; access to Japan’s affected areas was largely unobstructed, technical expertise was more readily available, and the country had long since understood its own seismic vulnerability (notwithstanding the seaside location of the Daiichi Nuclear Power Station). Japan was prepared to mobilize, but Nepal was not. Nepal faces a bleak and discouraging situation that simple recommendations cannot improve. From a demographic perspective, overpopulation strains urban infrastructure and crowds out individual economic opportunities. For families in rural areas, however, having children is an agricultural necessity and social safety net. From an economic perspective, upgrading industries and global linkages can hasten growth and generate domestic employment opportunities. However, the country’s landlocked geography, poor governance practices, and past insurgencies, along with the emergence of ambitious regional peers, complicate the pursuit of economic competitiveness. From a comparative advantage perspective, Nepal could focus on further developing its tourism industry, which accounts for 8% of the economy. However, step-gains in tourism—arguably even more difficult after the earthquake destroyed heritage sites—will not provide the economic boost needed to transform the economy. Agriculture, which constitutes the largest share of Nepal’s economy, is likewise confined to only linear growth and based largely on marginal improvements to productivity. A potentially new source of Nepal’s comparative advantage could be hydropower and the export of electricity to power-hungry neighbours, especially India. Nepal’s hydropower potential is estimated at 80,000 MW, out of which only about 700 MW has been developed. With a population of around 30 million, Nepal’s per capita electricity use of 106 KWh is one of the lowest in the world. Frequent blackouts in Kathmandu have been a major deterrent to economic and industrial development. Other mountainous countries like Norway and Switzerland have developed 56% and 87% of their hydro-potential (respectively), but Nepal has developed only about 0.8%. Even neighbouring Bhutan is aiming to boost economic growth by exporting electricity to India and Bangladesh. The past 30 years have been a case of missed opportunity for Nepal, due in large part to continuing mistrust with India and big brother-small brother dynamics. The situation is likely to worsen after the two earthquakes. Ideally, the present governments of India and Nepal would forge better relationships so that Nepal can develop hydropower both for domestic use and for export to neighbouring South Asian countries. Realizing this potential would have a transformational impact on Nepal, which now has very few alternatives and urgently needs a new path to development. Long-term concerns aside, Nepal must take progressive steps towards restoring services and providing shelter and basic necessities for earthquake victims. When recovery aid money is spent and life returns to some semblance of normalcy, Nepal will then face the mounting task of building true resilience: economic, social, and political stability. Given the challenges already faced, it has no other alternative. The country’s future depends on it.